I don't know about you, but every few weeks I fall into the "I have NOTHING to wear" trap. I feel as if I've already worn everything I own, and either my shoes or the weather aren't "right" for anything I have. In this week's fashion post, we're going to talk a little bit about changing up your outfits to make them look and feel a little different. As I say all the time, I spend the majority of my clothing budget on basic pieces. Every once in a while I will splurge on a trendy piece, but I typically stick to classic lines and colors. I find the clothes have a much longer shelf life this way, which is good for my budget and my outfit options. 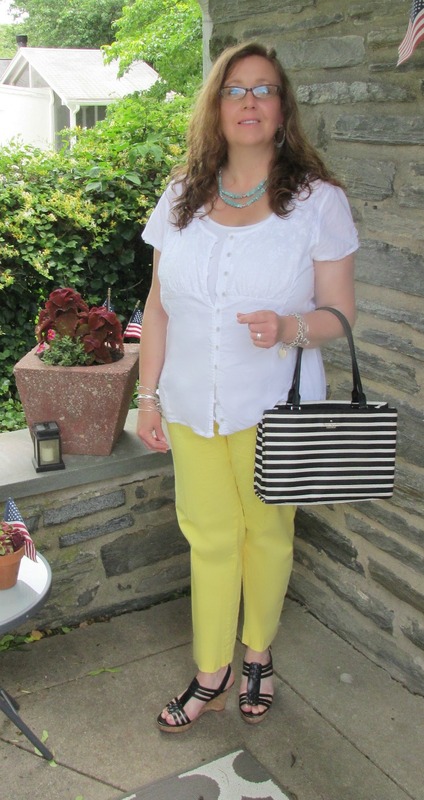 Take these yellow cotton ankle pants from Talbot's. 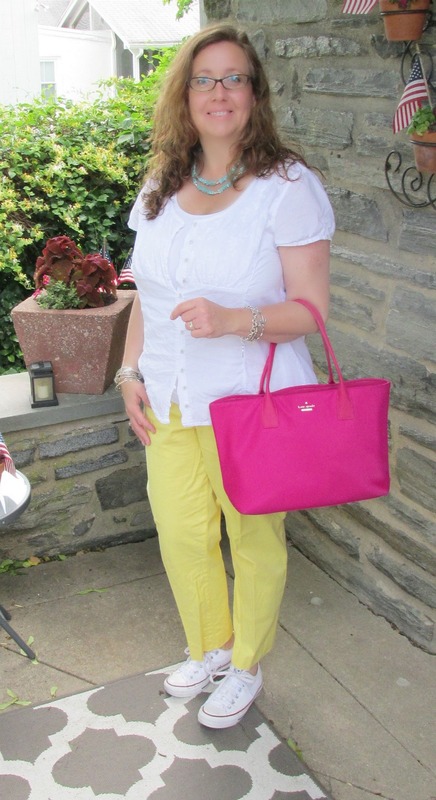 They were a gift from my mom, and I love the bright color and classic fit. They truly go with everything. In the past, I've worn them with black and white, at the beginning of spring when it's still cool out. I wanted to wear them on a short road trip to NJ last weekend, so I slipped on a white blouse and my white Chucks. This was the perfect outfit. It was cool, the temperatures were going up. It was comfortable for a long car ride and then hanging out my parent's house for the day. It wasn't jeans and a t-shirt and sometimes that alone is enough. As I was getting ready and debating shoes . . .I realized that I could change the "vibe" of the outfit by changing my shoes. I could dress it up for evening with black strappy wedge heels and a black and white bag. This would be great for dinner or drinks. 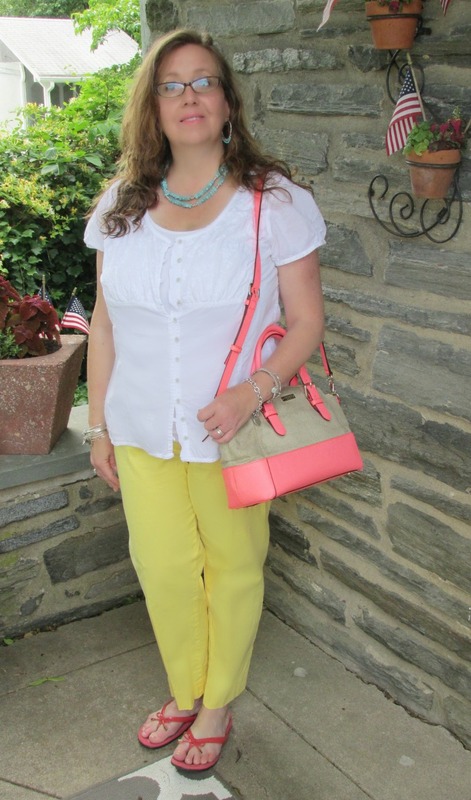 I could also go one step up in casual, by adding my favorite coral flip flops and coral bag. This would make it a great outfit for lunch, or shopping with friends. I didn't change anything else on the outfit - you could certainly change up your jewelry and perhaps add a scarf or fancy hair do to change the vibe even more. A coral statement necklace would look great!You could try the same experiment with a white button-down shirt. That added structure would give the outfit a different vibe altogether and then you could play around with shoes and jewelry. Don't forget hair. In looking at these pictures, I would do my hair differently, probably pull it back, which I am pretty sure I did after we hit the road! I hope you found some good ideas! 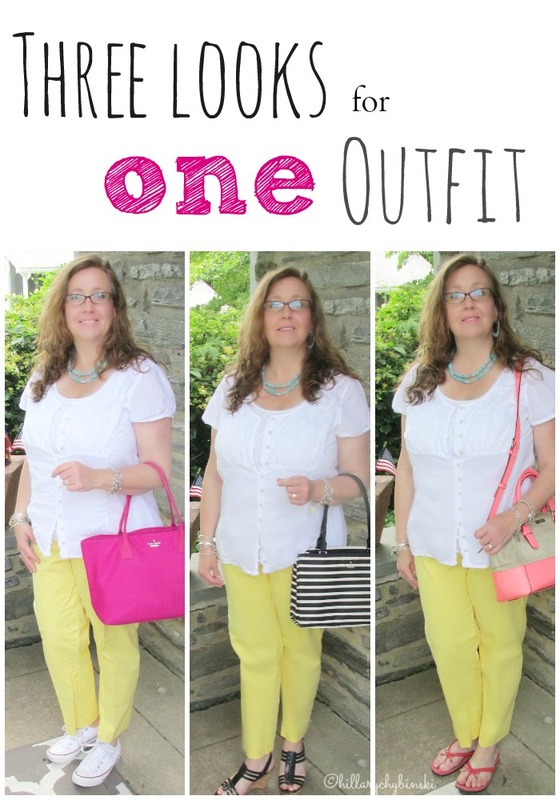 Each Wednesday, I share real fashion ideas and inspiration to help you get dressed in the mornings and highlight at least one outfit that I'm wearing right now, as well as provide tips for finding great outfits in your own closet. This post is linked up at The Pleated Poppy and at Jo-Lynne Shane - be sure to check them out for even more outfit itdeas and inspiration. I love how a simple change of the bag makes a huge impact on the overall look. Love those pants too! love the outfit with the converse. Any other outfits with the converse?